January is the National Blood Donor Awareness month, honoring donors and sponsors of blood drives. If you’ve been wanting to organize a blood drive, SignUp.com makes it easy with online SignUps allowing you to organize volunteers and schedule donor appointments in one place. Around the clock access from smartphones and computers, and eCalendar syncing with automated reminders mean you can concentrate on other details, like venue layout and T-shirt design! 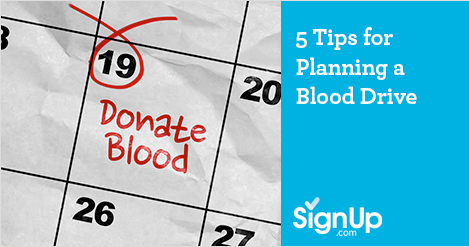 Follow this simple guideline for implementing your own blood drive. 1. Identify a Sponsor. The first step in organizing any blood drive is to contact the nearest blood bank or blood donation center and get assigned a liaison between your organization and the blood bank. 2. Choose a Venue, Day & Time. You know your organization best, so you probably have a pretty good idea of how large a facility to reserve. School gymnasiums and office lunchrooms are great for this type of event. Try to pick a place with a lot of parking for staff, volunteers and donors. Usually, the availability of the venue will dictate the scheduled day and time to some extent. Be sure to leave enough time to do adequate promotion, and remember to check for conflicts with other special events like football games or community fun runs. 3. Get Organized! Once you have your venue, place and time, create a SignUp on SignUp.com for volunteers and donors. Participants can sign up 24/7 right from their smart phones, tablets or computers. With free eCalendar syncing and automated reminders, it couldn’t be easier to remind everyone of their commitments on event day! Add a SignUp for people to donate food and drinks. 4. Promote the Event. Using the link generated by SignUp.com, take to social media to promote your blood drive. Use your organization’s newsletter to spotlight the need for blood in your community. Consider including a flyer in paychecks. Write a press release and get local media involved. 5. Have a Spectacular Event! Hold a raffle for a fun prize, and think of a way to celebrate each milestone on the way to your goal. If possible, provide small thank you gifts to your donors –a T-shirt or bumper sticker. Book the next drive right away! It is NEVER too early to schedule future drives. Be sure to write thank yous to your sponsor, volunteers and donors. It is so important to acknowledge this life-saving effort. Having a thriving local blood supply means your community—family, friends, neighbors, coworkers—always has access to life-saving blood when needed.